Delicious aromas waft through Stevens Point thanks to local business Zest bakery and coffee house. This cute small bakery and coffee house tucked away at the edge of the University of Wisconsin – Stevens Point (UWSP), opened in January of 2011. 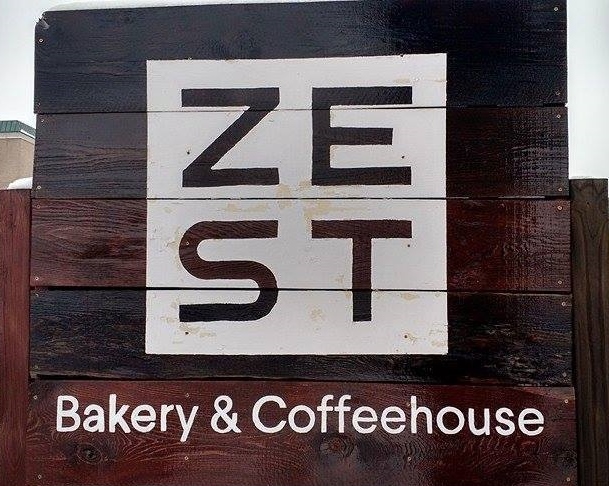 Zest has a nice at-home and cozy feeling when it comes to the layout of the bakery and coffeehouse. One of the unique things about Zest is the chalkboard. The board contains different coffees with creative themes to them. The broad changes often and it’s always exciting to see what is new. “We have an ever-changing menu from breakfast pastries such as croissants, muffins, Danishes, scones and galettes to our sweet treats like cupcakes, bars, cakes and cookies. We also offer over 50 different kinds of teas, 30 different kinds of syrups, the majority of which are made in-house, and every kind of coffee drink you could imagine,” Zest employee Jacob Marchant said. Voted Best Dessert at Taste of the Town in 2011, 2012, and best overall in 2012, Zest always will be sure to put a smile on your face. Anything a customer can dream up Zest can do. “At Zest, we strive to offer a product not found anywhere else in town. Whether it’s our unique flavors of housemade syrups, beautifully decorated sugar cookies or fun cake flavors, everything that comes out of Zest is intended to be remembered and talked about,” Marchant said. During the week Zest is open from 7:30 a.m. to 7 p.m. On Saturday Zest is open from 8 a.m. to 4 p.m. Zest is closed on Sunday. “We do see a lot of business from the university but we also have an amazing following of community members,” Marchant said. The community of Stevens Point loves everything at Zest but the product that sticks out the most are the sugar cookies. The sugar cookies are a masterpiece before your eyes. The decorated sugar cookies are all hand rolled and hand punched then decorated by hand to order by Brandi Marchant. Zest also makes great cakes for weddings, baby showers, and birthdays. Zest contributes to the City of Stevens Point with charitable contributions to multiple organizations including the Boys and Girls Club, Ascension St. Michael’s Hospital, University of Wisconsin-Stevens Point student organizations along with many others. Zest doesn’t have a website but they do have a Facebook page. “At Zest our goal is to deliver quality homemade items that will leave you wanting more,” Marchant said. I love this bakery . I go there a lot and I enjoy how inviting the employees are and how good the food is. I have been to Zest and they do have really good coffee and goods. I am also planning on writing my article on a coffee and bakery cafe called Emy J’s. Overall, good store. Really good article. I never knew about this little shop, now I will have to try it out!